Questions about Sami education have hardly ever lead to such a great interest in the media as the struggle concerning the Sami curriculum in 1997. In reality there were two different struggles, at firstwether there should be a separate Sami curriculum or not, and secondly where this should be used. It was the latter that made it to the media, the first one was less publicly known, but not less important. In the previous article we told that the first Sami curriculums were published in 1989. But the printer's ink was hardly dry before the first threats towards the Sami curriculums arose. We did not get to work in peace for a long time before the minister of education Gudmund Hernes started his work for reform. ... The idea of the ministry was that there should be only one curriculum for everybody, and that some Sami topics would then be fitted into the national curriculum. The Ministry of church, education and research wrote in a letter dated 14.01.1994 that the ministry had promoted: «the thought that the new basic curriculum should be a national curriculum which comprises all education of the primary school pupils in the country, including the Sami central area.» The argument concerning Sami pupils was that «it is important that all pupils in the Norwegian school acquires a better and broader knowledge of the Sami people's culture and history.» In other words the Ministry used the Norwegian pupils' need to learn about the Sami as an argument opposing the separate Sami curriculum! 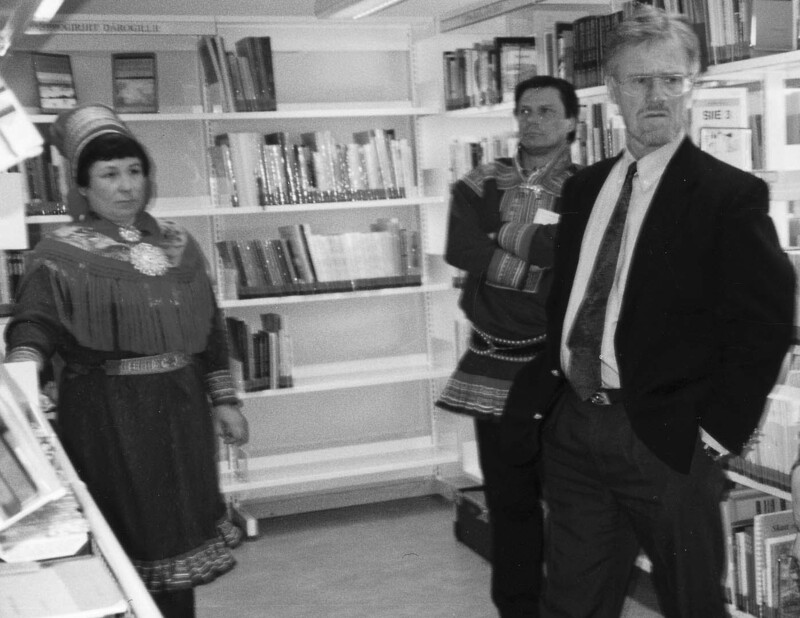 Once during his time as minister Gudmund Hernes visited the Sami educational council. Here he is in a guided tour in the Educational council's teaching aid exhibition with Kristine Nystad and Ole Henrik Magga. When we started the work with the new curriculums for the primary school, Gudmund Hernes was firm in his view that there should be one common curriculum for all pupils in the primary school, also the Sami pupils. It was not easy for a bureaucrat to oppose that. But since the Sami had their own curriculum for several subjects since 1987, they also did not accept this immediately, in particular the Sami Parliament protested. Ole Henrik Magga, the president of the Sami Parliament at the time, came to the ministry to discuss the matters with the minister and present his view. I was present in this meeting. It was not a good meeting. Gudmund Hernes was hardly prepared to listen to the view of the president of the Sami Parliament. I spoke to Magga about this afterwards. I had difficulties in understanding how two so competent men could go for each other's throats in that way. Hernes was probably a little arrogant in this meeting, it should be allowed to say, but as we were working with these questions, I suppose he also saw some different sides of the matter. But who should follow the curriculum? It was the single municipalities who had decided to what extent they would use the Sami curriculums from M87 (basic curriculum of 1987). When the work with the new Sami curriculums was started, on the contrary it was still not clear who should follow them. Neither those who wrote nor those who approved the curriculums knew for sure what the target group was, and they most probably based their work on pupils who had Sami as their first language. 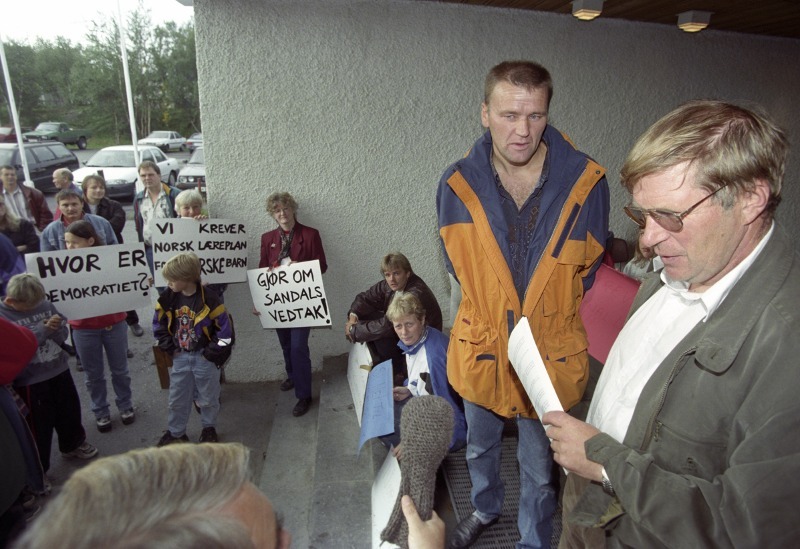 Demonstration protesting the introduction of the Sami curriculum in front of Tana town hall, 25.08.1997. Nr. 2 from the right is the leader of «No to Samiland», Jan Olsen. To the right mayor Leif Sundelin, who is being interviewed on the view of the municipality. The clearly stated goal of the first version of the curriculum was to educate new generations of Sami. From the beginning on it was not decided where the curriculum was to be applied. One did not agree on what the new curriculum was, or could turn into. And the curriculum opened for five different choices of language. ... Despite of all these choices, which also meant that one could choose not to use Sami completely, the principle part of the curriculum stated that the aim of the curriculum was to «...ensure a positiv development of identity and a functional bilingualism.» This illustrates that the plan had not been thoroughly worked through. The part concerning the bilingualism was removed from the final version of the curriculum. The struggle was not irrevocably settled until June 1998, when the majority of the Storting passed that the revised L97S should be used in all public schools within the Sami language management area. In the first version of L97S it was stated: «To grow up means to grow into the Sami and with time the Norwegian common culture». In the final version this was changed to: «For Sami pupils it means to grow into the Sami and with time the Norwegian common culture». The formulation that the curriculum should give the pupils a Sami identity was also changed. 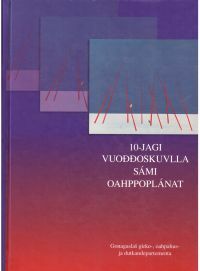 The apple of discord: The Sami curriculum for the ten-year primary school. The following year the new educational law was introduced, stating that: «The ministry makes regulations concerning other special curriculums for the primary school education in the Sami areas...» And with this it was concluded in the form of law both that there should be special Sami curriculums, and that these should be applied in the Sami language management area. Consequently there was no equivalent struggle with the following reform of curriculum in 2006.